I borrowed this questionnaire about books and reading from Kelli at She Learns as She Goes. I've been enjoying reading quite a bit more this year, so this will be fun to share. I normally don't like to eat while I read, except for recently. This semester has been one of the busiest I've ever had, which means I only get to read during the few minutes I'm home each day... and the few minutes I'm home each day tends to be the only time I get to eat! Bad, I know. So the last few weeks, my schedule has been something like: rush, rush, rush, get home around one in the morning, make a bowl of Grape Nuts, and munch while I read a chapter of a good book. It works out. Lately, I've been an orange juice fanatic. It's funny, because I don't like oranges, but I'm obsessed with drinking orange juice lately. It bugs me so much if I have to stop in the middle of a chapter. That's where the writer meant me to stop, not halfway through a paragraph. I think the only time I've ever thrown a book is at the end of reading The Boy in the Striped Pajamas. For some reason, I was absolutely not expecting that ending, and it horrified me. If the author irritates me, I'll easily stop reading the book. I am busy, so I only take the time to read something I enjoy or glean wisdom from. It depends on how much I can relate it to the context in the story. If it baffles me, I'll look it up using my iPhone. Modern technology is handy. I am currently reading 19 Minutes by Jodie Piccoult. The Purpose of Man: Designed to Worship by A.W. Tozer. I haven't started it yet, but I'm excited. I read when I am at home. I really like to read in my beanbag. I used to have a hammock chair, back in the day, and I would spend hours reading in that comfortable spot. Those were the days. I like both. I'll only finish a series if I love the book though, so it has to be worth it. Havah by Tosca Lee. It's amazing. It's about Eve (from the Bible). I'm always recommending it to women of all ages. I even got my mom to check it out. I have a ton of books, and I like to keep them in alphabetical order by author, but that doesn't always happen. They tend to get disorganized. One year ago: She is a leader. But here I write this song of love. I yearn for You like air, like water. My sustenance, You are enough. Break my heart when Yours is broken. Spill my life out on the ground. But for You, my heart is bound. Until my eyes see only Yours. Fill me with Your words of romance. Cleanse me on Your precious shores. One year ago: That Rascal. I'm about to brag on my grandma a bit, which might make her feel a little uncomfortable, but I want to praise Jesus for shaping a servant's heart in her and a desire to love others. This is my grandma. I call her Naana, but her real name is Dianne. My Naana has inspired me in many ways. She is a prayer warrior. Her devoted faith in the Lord has encouraged me on many days when I have faltered. My Naana and Pa will have been married fifty years this summer. Can you imagine? About twenty-one years ago, my Pa was in an accident and fell thirty feet. He broke his back and nearly lost his life, but my Naana stayed faithfully at his side, praying daily for healing. And my Pa can walk again, despite everything the doctors ever said. God has been so good to our family. Last summer, Naana discovered she had breast cancer. The day I found out, I drove to her house to offer comfort, but instead, she comforted me! She said, "I am thankful that the Lord has given me the opportunity to be a survivor." And Christ did bring healing. Naana survived and is now cancer-free. There were so many people praying daily for the complete healing of my Naana, even my beloved sponsored daughter from Kenya, Lavin. When I first started high school, Naana would pick me up from school once a week and take me to an inner city mission to serve and love on the kids of our city. My sophomore year, after I got my driver's license and could take myself, Naana still picked me up. 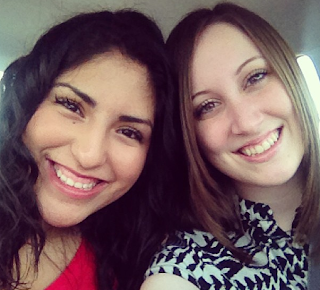 She encouraged my heart for missions and loving on needy children. One day, I got a call from my Naana. She had heard that a refugee family from a small country in Africa called Burundi had moved to our town. There were ten children of varying ages in the very poor family and no one could speak English. That same week, Naana picked me up from school, drove me to the family's house and picked up their children in her minivan. We took them to the shoe store and my grandma made sure every single child in that household had a sturdy pair of shoes. And every week for the rest of the school year, we picked up these kids, helped them with their homework, and took them to the inner city mission to learn about Jesus. When I began my journey to raise money to return to Kenya this June, Naana said a few times, "If you raise an extra $3,200, be sure to take me with you!" And I'd smile and say, "Of course!" We share a passion, and I did want to share a journey to Africa with her. But as much as I wished she could go, I wasn't even sure if I could raise enough money for my own plane tickets, let alone the money for two people. When my sister Ali came to visit a couple of weeks ago, we both expressed a desire for Naana to go to Kenya this summer. We felt like the Lord was clearly saying, "I want to send my daughter to Africa." Although we were certain at the time that we couldn't raise $3,200 on top of what I was already trying to raise in less than a month, Ali and I agreed to commit to praying every day until the plane tickets were bought for the Lord to provide in His good, perfect way. On Monday, I got a phone call from my mom. The Lord has recently laid on her heart the same desire, to send her own mom to Kenya, although she was unaware of Ali's and my commitment to prayer. So my mom and another of my sweet grandmas, Nawnie, have been raising money to send my Naana to Africa. Naana has always wanted to go on a mission trip to Africa, but it has never been possible. Now is her chance. And with complete confidence in the Lord's provision, our plane tickets were bought on Tuesday. 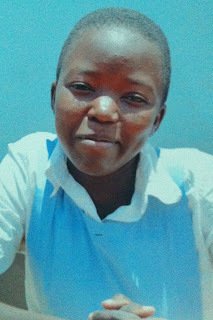 If you would like to donate to Naana's trip to Kenya, you can do so directly through the Christian Relief Fund website. Just be sure to specify that your donation is for "Dianne's Trip to Kenya." I can hardly wait to share my African experience with my Naana. The Lord is faithful. One year ago: She has a servant's heart. 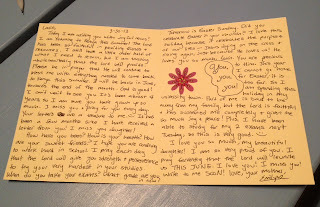 Every month for 2013, I will be sending a letter to my sponsored daughter, Lavin. Sponsored children love communicating with their adopted parents. It means the world to them. This month, I already sent a letter to Lavin, telling her that I would be returning to Kenya in June of this year. 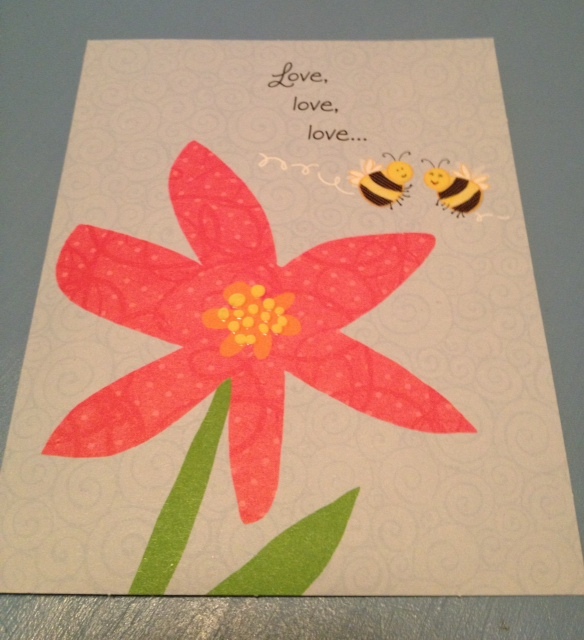 However, I have another card to send to my sweet girl, so I thought I would share it with you to possibly help inspire you of ideas of what to send to your sponsored child. It's spring in Texas, which means that wildflowers are everywhere. They grow all around, on the side of the roads, in backyards, in fields. 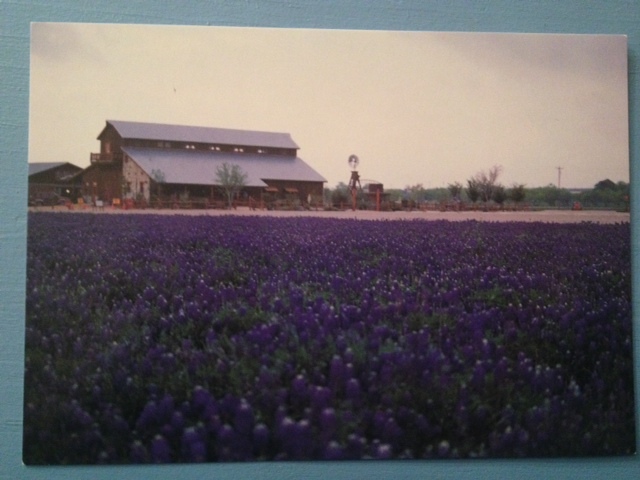 My favorite flower is the bluebonnet, which also happens to be the Texas state flower. 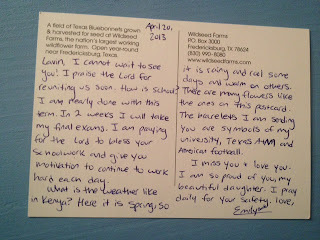 Because this is the season for bluebonnets, I decided to send Lavin a postcard with bluebonnets on the front, so she could see the beauty of God's creation in Texas. I talked about what was going on in my life, like taking final exams and getting ready to finish this term of school. I talked about the weather and flowers blooming in Texas. And I mentioned how I am praying for Lavin every day, as well as how much I miss her and love her. Instead of mailing the postcard by itself, I placed it in an envelope along with a few little goodies. Five photographs of my family. I was sure to write names and places on the backs of the pictures so that Lavin would understand what was going on. 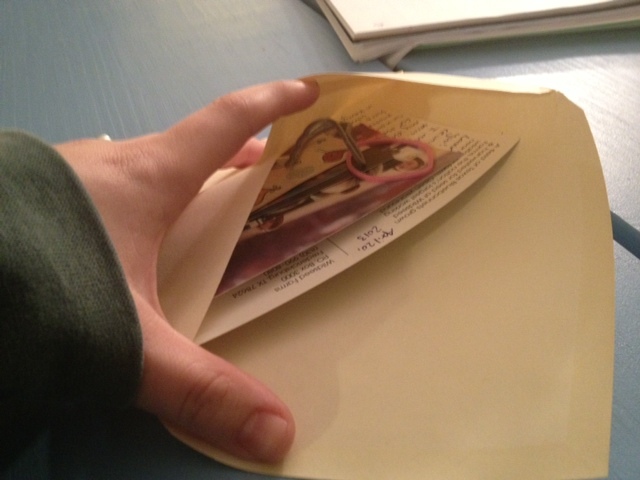 Notice how everything fits neatly into the envelope. The envelope is flat and lightweight, which is important when sending things to your sponsored child. 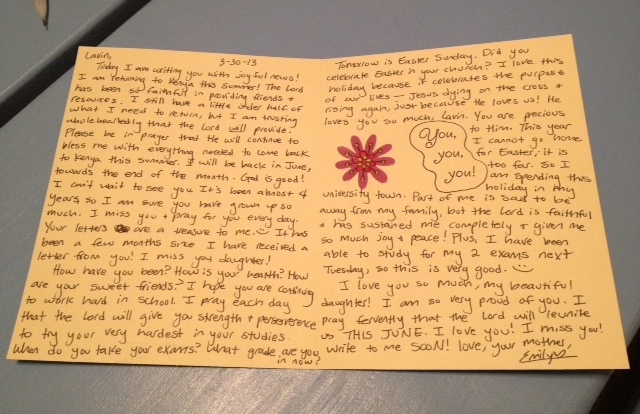 Have you sent a letter to your sponsored child today? If you do not sponsor a child, consider doing so through Christian Relief Fund. Two years ago: Easter Egg Hunting is for Big Kids Too! Ali came to visit about a week ago. We were so excited. When Ali and I get together after being away for too long, we talk... and talk... and talk. No one else can understand how there is so much to say, but there always is. On Friday night, we may have actually stayed up until after five in the morning. We should have taken more pictures this weekend, but we got distracted and forgot. Sorry about that. After sleeping in on Saturday, we dressed up to go to a banquet put on by my organization. My parents have never come up for family weekend at my school, but Ali usually does. We completely forgot to take pictures in our dresses, so this dorky in-the-car selfie is the closest we got. After the banquet, we returned home. We were talking about some serious subjects, but bizarre music coming from next door kept distracting us. In a college town, it is typical to have loud parties blaring from all over, but our next door neighbors aren't college students. They're a married couple in their forties with two young kids. Music that sounded like it had been taken straight out of a Bollywood movie kept echoing through our house. Ali finally ran outside to peek through the slats of the wooden fence separating our two houses. Within seconds, she was dragging me by the hand to look as well. A live Indian band, as well as four or five belly dancers were performing in front of a fairly large crowd of people. I'm still not sure why this gathering actually happened. It was one of the more entertaining moments of this weekend. I took Ali to her first-ever Ring Dunk. At Texas A&M, there is a tradition that when you get your Aggie ring, you drop it into a giant pitcher and drink until you get to the bottom and catch the ring between your teeth. Yes, this is a drinking game and is traditionally played with a large 60-oz pitcher of beer. However, tea, lemonade, and various colors of Kool-aid are all popular options for the Christian community at my university. On Sunday, Ali and I went to church together and then to Cracker Barrel with my roommate and our mutual friend, Rebecca. While we were waiting, Ali and I played an intense game of checkers. I won, by far. Ali was a bit distraught. When we got home, we spent a sleepy afternoon watching YouTube videos and an episode of Community. At one point, Ali saw a strange circular object on our mantle. "What's that?" she asked. "Oh, it's a portal," was my distracted reply. "Really? What kind of a portal?" Ali asked. I said, "It goes to Narnia." But she stuck her hand through just to make sure. Two years ago: You make me very angry. to Audrey Assad. 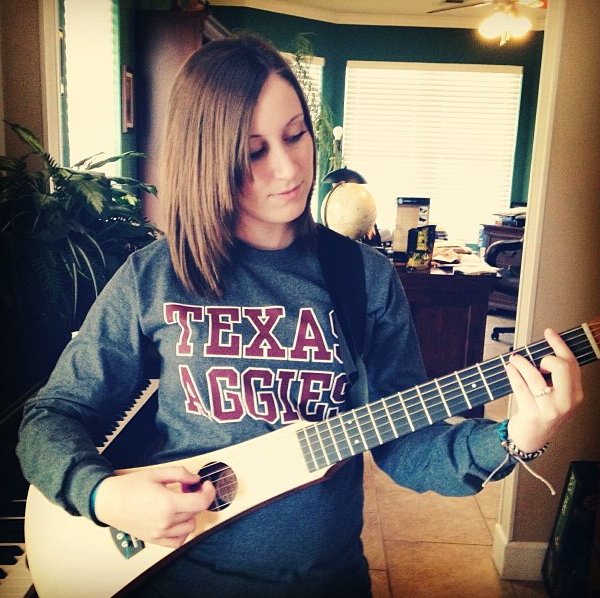 She's a Christian worship artist. My dad purchased her album a couple of years ago, but I never really got into her music. These days, I've been searching for quiet study music and I'm loving Audrey Assad. She has a pure, sweet voice, and lovely lyrics. Her album is a great way to maintain a spirit of worship even while studying for frustrating classes. I am also listening to this lovely rendition of a song I love on the piano. It's so good. My goal is to learn to cover this well over the summer. I've played the piano since early childhood, but I've taken a few breaks here and there, and then I never did bring my keyboard to college, so I only play piano when I'm home. Over spring break, I picked up the Pride and Prejudice song book and played through "Dawn" without as much difficulty as I thought I would. Now I would love to improve on piano over the summer and then hopefully bring my keyboard to school in the fall. "Left Behind" by Tim LaHaye and Jerry B. Jenkins. I've actually read this before several years ago, but since Nicolas Cage is apparently creating a movie re-make, I thought I would take another read. What do you think about the idea of the upcoming Left Behind film? Mulan. A week or two ago, it hit me how much I wanted to see Mulan again, but I didn't own the movie. After asking a ton of people, driving to four different movie stores, I found and bought the film and eagerly watched it that very day. 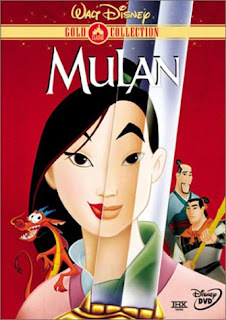 In sixth grade, I actually watched Mulan every day after school for a couple of weeks solid. I don't know what it is about this movie I love so much. The idea of a Disney movie with an independent female protagonist who needs no man to define her identity, but still ultimately falls in love of her own free will... I love it. about this summer. In only a couple more weeks, this semester will be finished and I will return to my hometown for a few months. Last summer was a difficult experience. 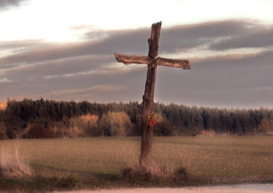 Perhaps I'll write more about this another time, but basically, last summer I felt completely stranded from the Christ-centered community I had found in college. I was lonely. I actually have so much hope for this summer. I feel as if the Lord is telling me, "Yes, you will be lonelier than when you're surrounded by a Christian community in college, but you are going to receive the sweetness of my presence over the next three months. I am faithful and I am a sustainer." Also, I will be heading to Kenya in June, which is thrilling. I love where I intern over the summer. I am trusting that summer 2013 will be a place of favor and rest. for my fundraising to Kenya. I am nearly there, as you can see from the counter to your right. The Lord has been working so powerfully in advance for this trip. His love is going to be shared in mighty ways, and I am honored to be a part of it. If you would like to donate to my trip, you can do so directly through the Christian Relief Fund website. 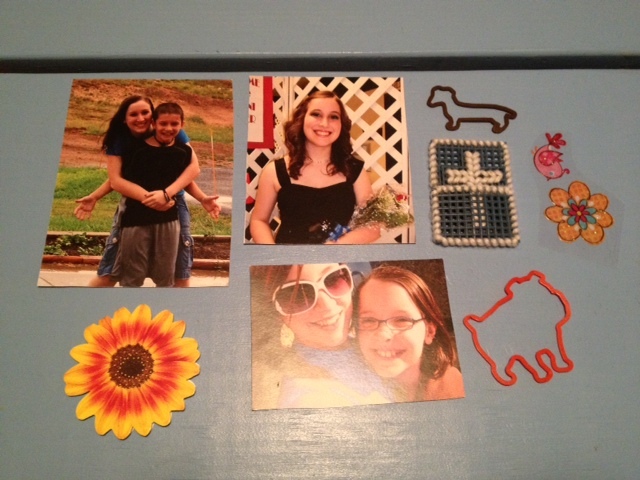 Be sure to specify your donation is to go to "Emily's Kenya Trip." What are you listening, reading, watching, thinking, and praying? Before we begin, in case you're new to Emily is Smiling and don't know anything about me, I'll start with five basics, so you won't get the weirdest first: My name is Emily. I'm twenty. I'm a college student. I have a huge heart for Africa. I am an intern for Christian Relief Fund. 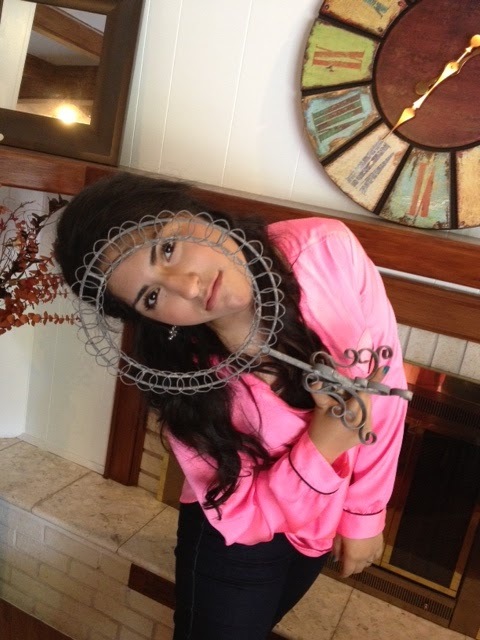 Now that that's over, here are twenty (kind of) weird facts about me. 1. 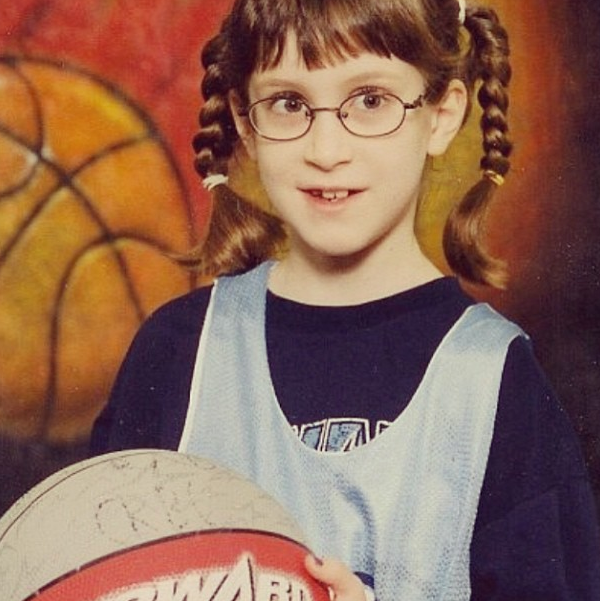 My middle name is Nicole. Even though it is a pretty common middle name, I used to like it so much that I would name all of the protagonists in my stories Nicole... especially if they were princesses. 2. My dream pet is a Morkie. That's right; a Maltese and a Yorkie mixed together. Yes, it's a real thing and I want one. 3. Because I was homeschooled throughout my childhood years, most of my memories growing up are a little bizarre. I had many adventures conjured up by my big imagination and happily enjoyed by my two younger siblings and next-door neighbors. 4. For example, I used to be convinced that Peter Pan was real. I loved the book, and each night, I would wait for him to arrive at my window and take me off to Neverland. Many of my stories and poems from my early elementary years were about Peter Pan. 6. My closet is color-coded very particularly. Two colors tend to take up the most space: maroon and blue. 7. My favorite crayon color is blue. Just blue. Perhaps I'm a little predictable. 8. 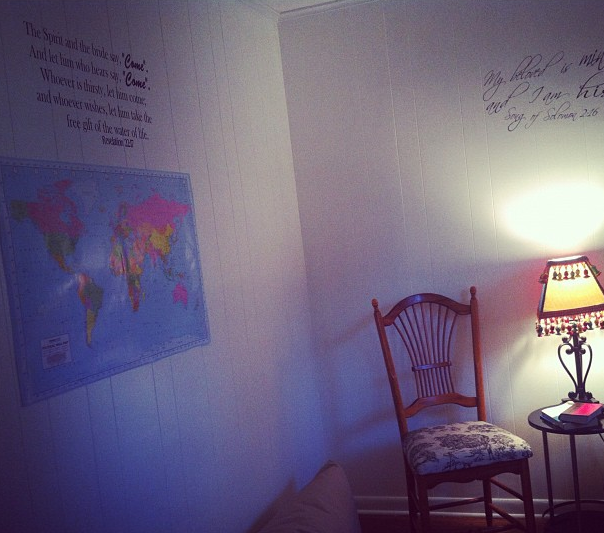 We have a prayer room in my little college house. It is certainly a sanctuary of peace and quiet, a great place to hide out after a chaotic day (and I have many of those). 9. I have been to fourteen countries, including: the USA, Mexico, Canada, Jamaica, Cayman Islands, Haiti, England, France, Austria, Germany, Switzerland, Italy, Holland, and Kenya. I will be returning to Kenya in June with Christian Relief Fund, if it's God's will. 10. My worst fear is sharks. I cannot even look at a picture of a shark without feeling a little sick. Something about their awful beady eyes gets to me. Ugh. 11. I can type 140 words per minute. 12. 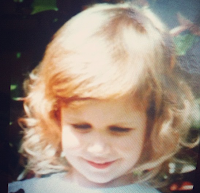 Once upon a time, I had blonde, curly hair. Now my hair is brown and ranges from wavy to straight. 13. I've taken four semesters of American Sign Language. I'm fluent enough to hold a conversation, but I'm not nearly at the level of an interpreter. 14. I don't speed. I wrote a blog post about this when I first started driving. On the downside, I get teased a lot by my friends for driving like a grandma. On the upside, I've never gotten a speeding ticket or even pulled over... and most of my friends have. 15. I am utterly obsessed with Sour Patch Kids. Any kind. I love them all. 16. If I'm in the car, I'm probably singing. 17. For Christmas this year, I got a backpack guitar... and I love it. 18. I could eat the same thing every meal, every day. And since I'm in college, not the most experienced cook, and in charge of my own meals, I tend to do so. 19. I have a thing about not touching door handles with my hands. I wouldn't consider myself to be extremely OCD, but I certainly have my tendencies, and touching public surfaces with my hands is what gets me. 20. If a car follows me for very long, I usually think they're a murderer following me home. Many nights, I end up taking weird routes home so the car following behind me won't know where I live. And then I finally make it home safe and sound and laugh at my own silliness. What are twenty weird facts about you? 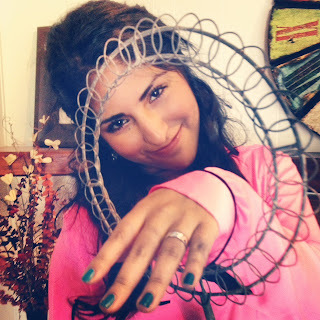 One of my goals for 2013 was to write my sponsored daughter, Lavin, more frequently. When I was in Kenya, I had the opportunity to pass out letters for the children from their sponsors. I saw the excitement and joy when they received communication from their adopted parents. Last year, I only wrote three or four letters to Lavin. My excuses were perfectly valid: I was busy, I kept forgetting. However, I've agreed to be a part of this little girl's life. I provide for her. My words to her are valued. When I send her things like "I love you" and "I'm proud of you" and "Try hard at school because you are worth it," they make an impact. For the month of April, I am actually sending Lavin two letters. I will share with you the official "April Letter" later in the month, but for now, I've written Lavin with news of my journey to Kenya in June. Telling Lavin about my return to Kenya in June. Asking questions, such as: How is your health? When do you take your exams? How did you celebrate Easter in your church? How are your friends? I talked about Easter a little bit (the purpose of Easter, not things like Easter eggs and chocolates). I shared a prayer request. I told her how proud I was of her and that I was praying for her. 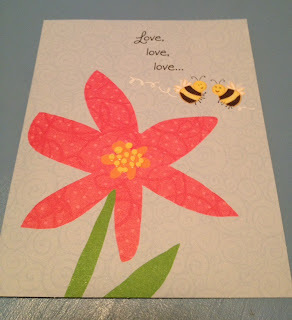 And, like always, I stuck some goodies in with the card. 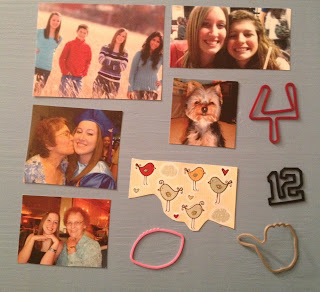 Three pictures of me and family members (with names on the back of each picture). A little cut-out of a pretty flower. A crocheted cross in a pouch. Two Sillyband bracelets in the shape of puppies. Have you sent a letter to your sponsored child this month? If you would like to support me in my journey to Kenya this summer, I still have a little over $500 to raise. You can donate directly through the Christian Relief Fund website, but be sure to specify that your donation is for "Emily's Kenya Trip." One year ago: She is industrious. By now, you've probably heard about the tragic explosions at the Boston Marathon. At least two were killed and more than 100 injured. So many families are grieving in America today. When things like this happen, I always feel shaken into reality. Each day, I live my life feeling safe and secure. Carefree, I walk to class. I go to sleep without fear. I wake up, get in my car, and hurry through my day without much concern for the things that could happen. Most days, I feel perfectly safe. The men and women running the Boston Marathon today probably also felt secure as they prepared to run 26.2 miles. After training for months, nerves must have been high and excitement filled the air. Surely no one began the race with awareness of the terror waiting for them at the finish line. In August, I shared about my experience living near the scene of a shooting close to my university. What a horrific, horrific thing. My mind can't fully wrap around how a man could so casually take the lives of those around him. It's hard for me to understand what kind of a world this is where evil so easily happens, where a violent, terrible tragedy can hit so close to home. My heart is broken for the families that lost loved ones. My heart is broken for the loss of peace and security in my neighborhood. There is great unease now. So much confusion. It's been a couple of days since the incident. The crime tape is gone. No more police cars. Most of the news reporters have wandered off to newer stories. But the feeling of sorrow in this community has not yet gone away. Our hearts are crying out for those affected by this tragedy and for the brokenness of this world in which we live. The world is so broken. We wander about our day-to-day lives, living in secure, familiar, comfortable boxes that we are eager to create, but that isn't how life truly is. With the drop of a hat, every pretense can be shattered. Life is a mist. So quickly it can be ended. Whether we are living in the jungles of the Congo or driving our cars through the streets in Oklahoma, life is not certain. If we are honest with ourselves, it is easy to see the brokenness of this earth. We know that people all around us are hurting. We know that life can be lost. There is sorrow. There is tragedy. But there is also joy. Amidst the brokenness of this earth, we have one thing that matters more than anything else: the love of Christ. In the case of the explosions in Boston today, the same difficult truth is evident. We live in a broken world filled with insecurity and violence. If you don't believe there is need for a Savior, turn on any news station. There is death. There is pain. There is uncertainty. Tragedy so often strikes when we least expect it. I go to school at one of the biggest universities in the nation. One day when I'm sitting in class and taking notes, a shooter could come and take my life. Bad things happen. As long as we live on this sinful earth, we will face grief and sorrow. This is why God sent His Son, Jesus Christ, to take the place for our sins. He suffered and died for us. Despite the fact that Jesus never did anything wrong, He experienced in fullness every temptation and consequence of living on a broken earth. But He overcame sin. He claimed victory over death. After three days in a tomb, Jesus rose again and lives today. He offers redemption and salvation to anyone who has faith in Him. His love is powerful. There is no security in this life, but the Lord offers peace and hope for eternal salvation in Him. Even in times of tragedy, there is joy, because one day Christ will return victoriously. John 16:33 says, "You may have peace in me. Here on earth you will have many trials and sorrows. But take heart, because I have overcome the world." When everything else is lost, there is love. Christ loves unfailingly. Cling to Him. In peace I will lie down and sleep; for you alone, O Lord, will keep me safe. AIDS, do you really have mercy? A striking memory from my trip to Kenya a few years ago was when a little girl named Sarah pressed a folded note into my hands. The lines to her poem were written painstakingly within. AIDS, AIDS, want do you want? You kill my mother. You kill my father. no clothes to wear, and no place to settle. killing the leaders, rich and poor. You never choose, and why? Sarah is bright, articulate, and has a beautiful smile. 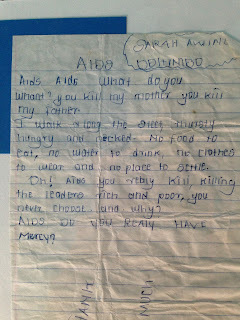 Despite all of this, her future is dauntingly uncertain because Sarah is an AIDS orphan. In an impoverished country filled with abandoned children, Sarah's story is all too common. AIDS ravages so many families in Kenya and orphans millions of children each year. There are currently more than twenty million AIDS orphans worldwide, and the number is rapidly increasing. My own sponsored daughter, Lavin, has experienced a life unimaginably difficult. Her father died from AIDS, leaving Lavin and her widowed, illiterate mother to survive alone. Lavin lives in a single-room mud hut without running water or electricity. No one was able to offer her any kind of medical care or education. No one provided her with food or clothing. 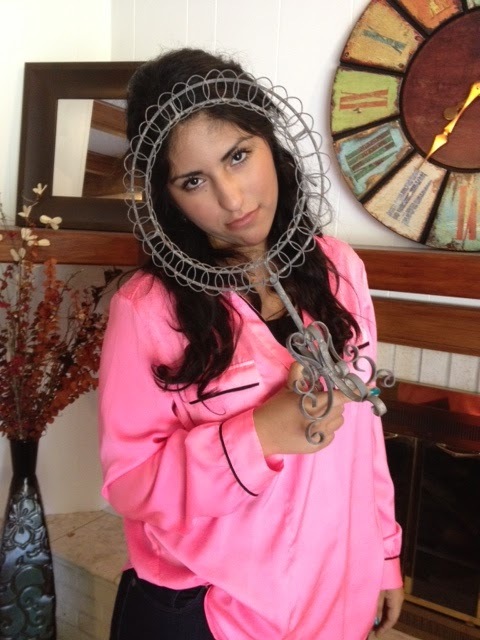 Struggling to make it through each day on her own, Lavin must have felt so forsaken. Through sponsorship, Lavin's life has been transformed. Christian Relief Fund provided her with an education, medicine when she was sick, clothing, and food. Lavin was connected with a church and Christian leaders who were willing to pour into her life and share the Gospel. Lavin's future has been brightened by so much hope. Children like Lavin and Sarah have known all too well the realities of grief, loss, and hunger. They yearn to break free from the chains of poverty, but they cannot do so without support. What is your role in this? God has made our responsibility clear. James 1:27 says, "Religion that God our Father accepts as pure and faultless is this: to look after orphans and widows in their distress." If the forgotten, abandoned children of this world break the heart of the Creator of the universe, how can your heart possibly remain whole? To love the least is to better know the heart of God. Jeremiah 22:16 says, "'He defended the cause of the poor and needy, and so all went well. Is that not what it means to know me?' declares the Lord." One way you can change the life of an AIDS orphan is through sponsorship. Christian Relief Fund provides nourishing food, basic medical care, clothing, schooling, and spiritual teaching to sponsored children. You can give an invisible child whose life has been overshadowed by disease and starvation a voice for the very first time. 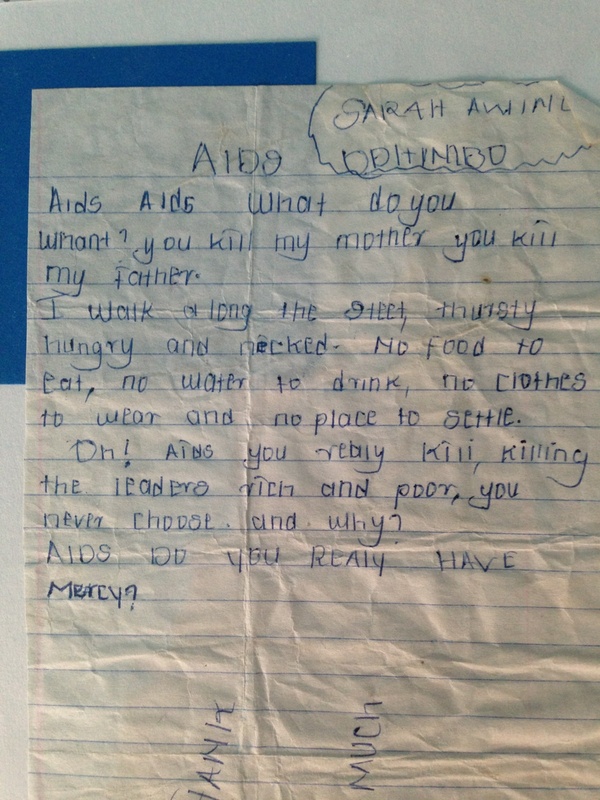 Sarah's poem is such a poignant reminder of the harsh realities of life for an AIDS orphan. She has been given a beautiful voice. With an education, the Gospel, and the sustenance to survive her childhood, Sarah is daily being equipped to provide for a family of her own one day and begin to change the future of Kenya from a land of extreme poverty to a land of hope. Consider sponsoring an AIDS orphan today. As little hands grasp my very own. Eyes as bright as stars, haunted by their scars. I see their gazes and I am undone. Precious little lambs with tiny, fragile hands. Forgotten, their voices go unheard. And yet, we still have never learned. My dreams broken at night by the silence of their cries. If they are thirsty, then so am I. Together, let us speak out for the rights they seek. Hand in hand, we can be a light. Two years ago: My own little impact. One year ago: She is trustworthy. My prison is dark and solitary. I spend each day in the cold solitude of my cell, wrapped in a tangled web of heavy chains that burden my shoulders and cut into my skin. When I was a child, I knew things of soft grass and falling snow, but even the loveliest of memories are snuffed out after years in a place like this. What is the sky? What is the sun? Meaningless murmurs of a life lost. My sky is gray slabs of rock. My sun is a flickering lantern, its flame faltering under the draft that hisses through my cell. Existence is captivity. Nothing else. Crumpled notes are pressed daily beneath the iron door to my cell. Notes of promise, words that slice through my burning heart. Let me in, my love. Love? What a foreign, frightening word. I cannot help but think that words like "love" are too distant to ever reach to the depths of one like me. But still the notes come. On one particular day, I strain too hard against my chains. The chapped skin on my wrists begin to bleed again, and I fall back against the cobblestones, weeping. I have fallen so far. Another note slides beneath the cell door and falls open. Let me in, my love. My voice is broken and small, but I croak out two words that draw every ounce of strength in me: "Come in." With a mighty groan, the door that has separated me from every part of the world swings open and then breaks in half. Trembling, I wait for the wrath of the one who has broken into my cell with such power and triumph. But his gaze only holds love. A broken sound falls from his lips as he eyes my chains, my wounds, the frailness of my hungry body. He reaches out scarred hands to caress my aching arms, and with his touch, the shackles split in two and fall to the ground. "Come with me," he says and takes my hand to help me to my feet. I totter under the weight of the chains I keep clasped tightly around me. They no longer bind me, but I hold them still, unwilling to fully release all I have known for so long. As I stumble through the doorway and into the blinding light of the outside world, I cannot believe my eyes. Gentle waves lap against a shore cloaked in sand as white as a wedding gown. Sunlight filters through the leaves of the trees hanging above me. Beauty, such beauty that I have forgotten while staring at the gray stones of my cell. We walk down the beach together, hand in hand, but my chains quickly become too heavy to carry. My arms tremble beneath their weight. I falter and fall hard onto my knees, breaking into sobs at my failure. How can I ever truly fall in love? How can I enjoy the beauty displayed all around me? All I know is captivity. Even after liberation, my thoughts whisper to me my worst fear: that I can only ever be a prisoner. My deliverer kneels beside me. "I love you," he says, but I struggle to comprehend his gentle words. Sure, he loves me. He broke me out of my prison cell. He loves me, but he cannot know my heart. If he did, he would see a pit as filthy and as cold as the damp cell where I have spent my life. And if he ever saw me as I truly am, he would drag me back where I belonged. "Let me show you something, love." He reaches for the sand at our feet and clutches a handful, allowing it to sift through his fingers until only a few grains remain in his palm. "This is how much you think I love you," he murmurs. He stands, motioning around us at the miles of white sand, at the vastness of the beach stretched before us. "This is how much I love you." I am afraid. I am in awe. My heart pounds with new stirrings of love. Trembling, I allow each shackle to fall from my arms and thud to the ground. They lay coiled at my feet like a snake trampled into the dust. "Come with me," my deliverer murmurs. "You have been set free. There is no need to cling to chains from your past. In my love, there is only freedom." Smiling shyly, I reach to take the outstretched hand. We walk together, deliverer and one who has been set free, lovers, friends. Two years ago: I wish I was a computer nerd. I have been sharing goals each month for a while now. I borrowed this idea from Kelli at She Learns as She Goes. This is a way for me to focus on living in the moment while setting reachable goals that aren't an entire year away to accomplish. I'm trying to trim up a bit before summer comes. I normally drink 1-2 sodas a day (I know, very bad), so I am going to try to cut this down. No sodas during the week at all: only Saturday and Sunday. Read at least one book this month. My goal is to read at least twelve books this year, and although I've already nearly passed this goal, I would like to go ahead and continue to read at least one book each month. Raise all of the money needed to travel to Kenya this summer. My goal is $3,200. Because of God's grace and faithfulness, I have raised a little over $2,000. I am more than halfway, but there is still $1,200 left to go. If you feel led to donate any amount to my trip to Kenya, you can donate directly to the Christian Relief Fund website and indicate that your donation is to go towards "Emily's Kenya Trip." I trust that the Lord will be faithful and provide the way to Kenya this summer. Finish going through my clothes and give away what I do not need. I went through parts of my closet last month; I'd like to finish the job this month. I need to bring two weeks worth of clothes to Kenya, so I wouldn't mind choosing which clothes I would like to bring and then leave behind. Make Bs or higher on my exams. I have not failed an exam yet this semester, but my scores on average have been lower than what I would like. My goal for this month is to work hard and make the highest test scores I have so far. Find more time to rest. I have been going without sleep for a while now. I'm worn down and exhausted. The more I wear myself thin, the more I am preventing myself from living to the fullness of my ability. Although the Lord will work through me no matter what, it's His will that I take care of my body and mind. I want to prioritize my time better and allow myself to get more rest. What are your goals for the month of April? Share them in the comments below! Two years ago: All we need is to trust in Him. I'm starting a mini-series about blogging. I've been blogging somewhat consistently since 2009, so for nearly four years. Quite often, people will approach me in person or in email and ask for tips about blogging. Every Tuesday for the month of April, I will be sharing blogging tips and encouragements for all of you who blog or are considering taking up blogging. If you are encouraged or have any feedback or additions to what I have to say, please feel free to share in the comments below. 1.) It's a ministry. When I first started to blog as a junior in high school, my reason was to write. I have a writing itch; I always have. If I go more than a day without writing, I find it difficult to concentrate. Instead of writing each day in a journal no one ever read, I thought I would share pieces of my heart with anyone who cared to read them. I blogged for a solid year, doubting that anyone really read what I had to say, although I received thoughtful comments now and then. In April of 2010, I learned how to check my stats for the first time and was stunned to see that my blog had received over 100k views. Wow. In recent years, my email inbox and comments have been full of responses, many of them being questions about faith. Since 2010, I have realized more and more what a ministry tool blogging can be. Each day, I can have a conversation about the Gospel and about Christ with people I may never meet. I can encourage girls who struggle with things the Lord has helped me to overcome. My blog has become more of a ministry than a journal, although I use it for both things. Being able to use the daily things I write in a way that glorifies the Lord and bring others closer to Him is such an honor and a blessing. If you have been considering starting a blog of your own, consider it as a ministry for you to pursue. You are reaching others with your words. You can share what the Lord reveals to you each day. Blogging is a ministry. 2.) Blogging captures memories. Whenever I travel or leave the country, I blog about my experiences, writing in detail about what I learned and saw, and sharing photographs alongside each memory. I love turning back to my posts from July, 2009, when I journeyed to Kenya, Africa with Christian Relief Fund. If you enjoy traveling, consider keeping a blog. You can capture your memories in an online journal while sharing your experiences and prayer requests with friends and family. 3.) It's a conversation. I have been able to communicate with hundreds of people over the last four years through this blog. When I share something, I don't intend for it to be one-sided. I love to hear what others have to say. Conversations are started. Encouraging comments and emails have literally brightened my days. The conversations you have through your blogging community can be encouraging and excellent learning opportunities. 4.) Your writing skills will improve. Although blogging is delightfully informal, the more you write, the more you improve. I can easily say that my writing style has improved since I started blogging four years ago. I can sort out my thoughts more easily and communicate through what I write much more clearly than when I first started blogging. 5.) Express yourself. We live in a big world. It's difficult to make your voice heard. Your blog may get ten views a month, but your voice will be out there. What has the Lord been teaching you today? What is a trial you've conquered and made it through? How could you encourage someone going through the same thing? Your blog can be your voice. Share what you have to say. Communicate with people like you. Open your heart. Vent your frustrations. Praise God for His faithfulness. Ultimately, blogging is an expression of your thoughts and values. It's your voice. On May 1, I will have a Blogging Q&A where I will answer any questions you have about blogging. Leave your questions in the comments, tweet them to me @emilytheperson, email them at emilytheperson@yahoo.com, or send me a message on my tumblr. Earlier in the month, I shared my goals for the Month of March. I took this idea from Kelli at She Learns as She Goes. Because March has ended and April has begun, I'll share with you my monthly report card. If you made goals for this month, share your report card in the comments below! I consider this a total victory, because even though I blogged thirteen times, I didn't do it on purpose. When writing this report card, I nervously checked to see how many posts I had. I wasn't sure if I made my goal. This means that I didn't blog out of obligation, which I consider a win. This month, I read Harry Potter and the Deathly Hallows and Iscariot. Unfortunately, the big wave of my exams this month happened after spring break... and even though I was home relaxing, I didn't actually study that much over spring break. My first test was the following Monday, and the next two tests were that Wednesday and Thursday. Rough! Needless to say, I did not do as well as I hoped. I wanted to make As and Bs on all of my tests, but I didn't quite reach that this month. I did longboard more this month. 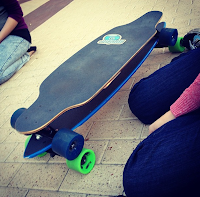 I even longboarded to class a few times in the cold, but I didn't longboard once a week. The air is still chilly, I've been in a hurry more often that not, and my longboard tends to remain propped up against the wall. I went through my closet and got rid of about eight or nine shirts. However, I didn't go through it as thoroughly as I planned. Before I go back to my hometown for the summer and before I travel to Kenya, I want to fully go through my closet and get rid of every single item of clothing in my closet that I rarely wear.